A 27-year-old female with a history of systemic lupus erythematosus (SLE) was referred for evaluation of unilateral macular drusen. Family history of familial drusen was negative. On examination, visual acuity was 20/25 in the right eye (OD) and 20/20 in the left eye (OS). Funduscopy OD revealed numerous (>80) yellowish temporal perifoveal lesions (A). Funduscopy OS was normal (B). EDI OCT OD showed drusen-like deposits (DLDs) located between the retinal pigment epithelium and Bruch membrane, with the largest DLD measuring 232 μm in base and 89 μm in elevation (C). Macula OS was intact by EDI OCT (D). Further systemic work-up revealed no evidence of glomerulonephritis. Diagnosis: drusen Like Deposits in SLE. 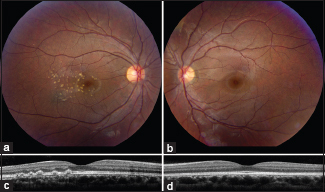 Ocular involvement in SLE can occur in up to 30% of patients. Asymptomatic choroidal alteration and DLDs in patients with SLE glomerulonephritis were first described in 2011 by Baglio et al. using indocyanine green angiography. Later in 2017, Invernizzi et al. documented presence of DLDs, with or without glomerulonephritis, however, they found that patients with glomerulonephritis demonstrated more DLDs per eye, larger DLDs, and DLDs involvement of >3 quadrants (all P < 0.03). We advise patients with SLE to have a thorough dilated funduscopic examination. A screening EDI OCT should be considered in patients with SLE. Palejwala NV, Walia HS, Yeh S. Ocular manifestations of systemic lupus erythematosus: A review of the literature. Autoimmune Dis 2012;2012:290898. Baglio V, Gharbiya M, Balacco-Gabrieli C, Mascaro T, Gangemi C, Di Franco M, et al. Choroidopathy in patients with systemic lupus erythematosus with or without nephropathy. J Nephrol 2011;24:522-9. Invernizzi A, dell'Arti L, Leone G, Galimberti D, Garoli E, Moroni G, et al. Drusen-like deposits in young adults diagnosed with systemic lupus erythematosus. Am J Ophthalmol 2017;175:68-76.